Podcast Archive - Page 2 of 36 - Dr. Tom Roselle Live! 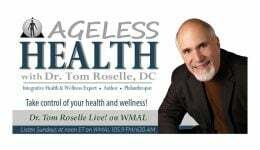 Dr. Tom Roselle, DC Reports on Various Health Topics Listen to Dr. Tom Roselle, DC report on various health topics including the Zika virus, cardio testing, intermittent fasting, epigenetics /stem cell Involvement, GMOs, and public health & policy. Visualizing Pain with Thermography Listen to Dr. Tom Roselle, DC and Derreth Painter, ACCT discuss Visualizing Pain with Thermography.